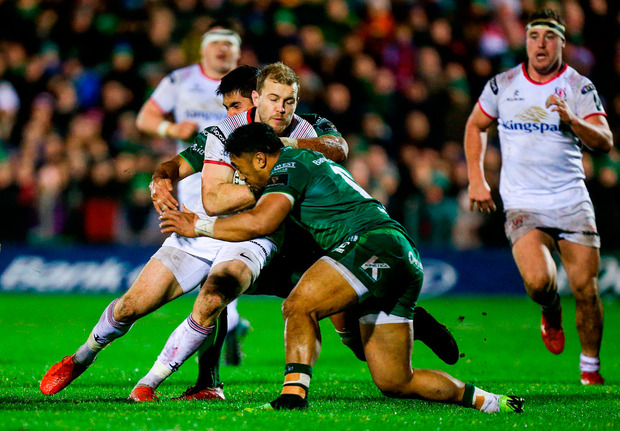 Connacht leapfrogged Munster into second place in Conference A for 24 hours at least as tries from Shane Delahunt, Bundee Aki and Caolin Blade led Andy Friend's side to a first double over Ulster. It was an impressive display from Andy Friend's side and they will be thrilled to have held on for the win after Jordi Murphy's try 13 minutes from time turned the heat up on the home side. The opening score came for Friend's side, off the back of a dominant scrum which earned the game's first penalty after 10 minutes. A cross-field kick from Johnny McPhillips looked to be heading into the arms of Cian Kelleher but the Connacht winger lost the flight of the ball, it struck him on the head and Kernohan had a simple job to touch down. 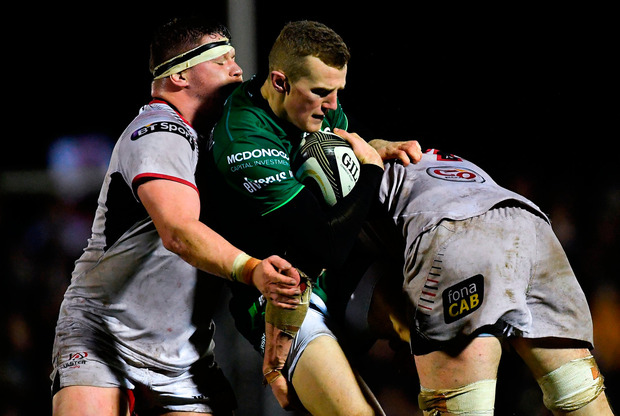 Considering they had been so dominant but then saw their lead halved, this was a real test of Connacht's confidence after their Leinster collapse last time out, but they began the second half with real intensity. Try number three soon arrived in the 43rd minute, and it was a brilliantly-worked score. Kyle Godwin's chip over the top sent Ulster backpedalling, but the bounce was kind for Carty and he sent Blade over for a stunning try. 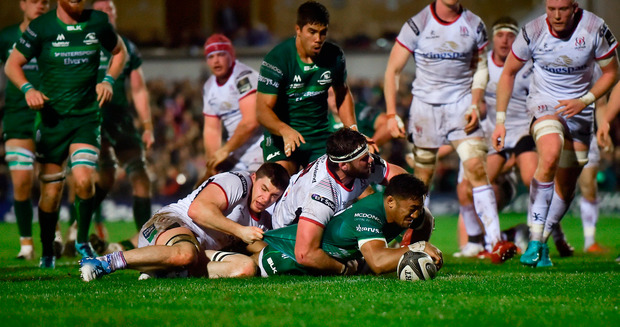 Ulster were certainly rocked by that score and McPhillips's restart went straight into touch, and another scrum penalty was earned by Connacht - their third from three put-ins - from the resulting set-piece. Carty missed the kick from the halfway line though, and their lead remained at 21-7. Dan McFarland's side came into this game on the back of four consecutive wins and they showed some of that determination with a good attacking set after 52 minutes, but they met a Connacht defence that was in superb form and eventually replacement Stuart McCloskey knocked on, which eased the pressure on the home side. A brilliant break from Colby Fainga'a almost gave Connacht the bonus-point try, and with Thornbury in excellent lineout form - he turned over two of Rob Herring's throws - they continued to pile the pressure on the northern province. 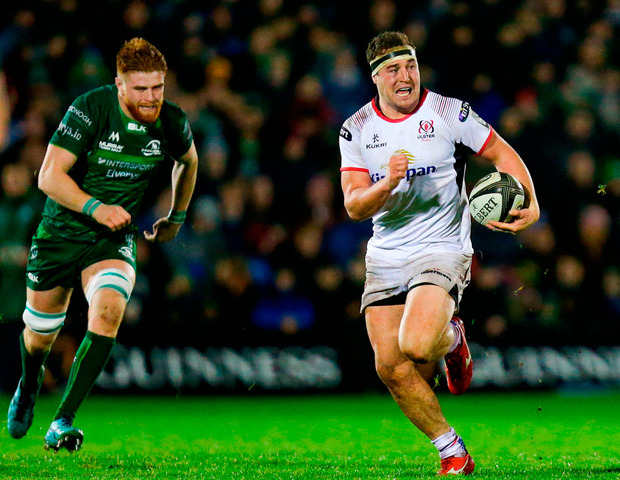 A minute after his introduction Ultan Dillane was sin-binned when he infringed at a lineout and straight away Murphy scored when Ulster mauled from the lineout, although Cooney missed the conversion. Scorers - Connacht: S Delahunt, B Aki, C Blade tries; J Carty 3 cons. Ulster: A Kernohan, J Murphy tries; J Cooney con. Connacht - D Leader; C Kelleher, T Farrell, B Aki, K Godwin (S Fitzgerald 63); J Carty (D Horwitz 77), C Blade (J Mitchell 77); D Buckley (P McCabe 66), S Delahunt (D Heffernan 54), C Carey (D Robertson-McCoy 40); G Thornbury, Q Roux (U Dillane 66); S O'Brien, C Fainga'a, J Butler (P Boyle 64). 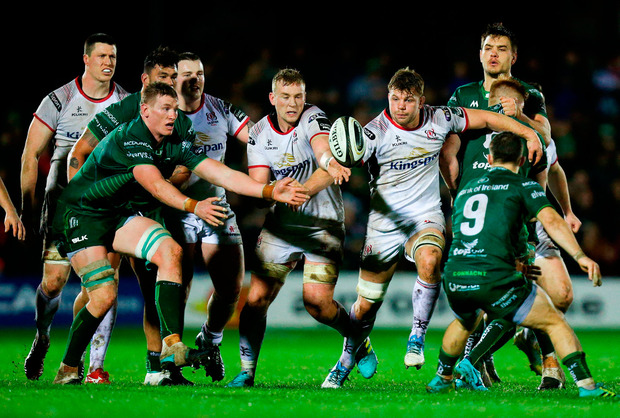 Ulster - L Ludik; H Speight (D Shanahan 60), W Addison, D Cave, A Kernohan; J McPhillips (P Nelson 52), J Cooney; E O'Sullivan (T O'Hagan 48, O'Sullivan 67), R Herring (A McBurney 77), M Moore (R Kane 48); I Nagle (C Ross 77), K Treadwell; N Timoney, J Murphy, M Coetzee (G Jones 46 HIA). Ref - Marius Mitrea (FIR).